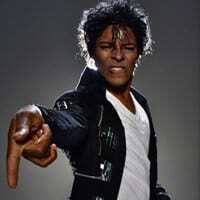 Michael Jackson Look Alike Tribute Artist Tribute to Michael Jackson is a live singing and live dancing show, The show can also includes additional live dancers on request. He is the best Michael Jackson Celebrity Look Alike, Lookalike Impersonator Tribute Artist from the Michael Jackson era of the 1980’s such as “The Way You Make Me Feel”, “Billie Jean”, “Thriller” to “Black or White”. His remarkable natural resemblance, spectacular dance moves, and musical vocal strive make him one of the nations top celebrity impersonators, singer and artist. Conventions, Corporate Events, Birthday Parties, Wedding Receptions, Charity Events, Bar Mitzvahs, Family Reunions, Sports Events, all over the states and he has even performed in England and Japan.